McNett's Gear Aid Cuts and Bolts™ Repair & First Aid Kit » Protective Solutions, Inc.
Gear Aid Cuts and Bolts™ kit is a combination first aid kit and gear repair kit for a solo and small group trips. If you spend enough time outdoors, eventually something is going to go wrong. Whether its a slip of the knife, a scraped knee, or a gear malfunction, you’re eventually going to run into some bumps along the way. Being able to deal with the issues when they come up is critical to a good trip. 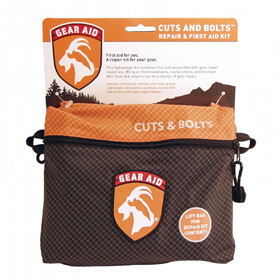 The Cuts & Bolts Kit is packaged in a light but rugged rip-stop nylon zippered pouch. The kit contains 52 of the top gear repair and first aid products and insightful, illustrated instructions. First aid items are suitable for non-trauma minor injuries, non-perishable and ready to repair you. 38 gear repair items are included, even buckles.